BROOKLYN NINE-NINE brought in Bill Hader as the squad’s new captain…and promptly killed his character, Captain Dozerman, off in the season premiere. The premature death wasn’t always the plan, but became a necessity due to Hader’s increasingly busy career. Unfortunately for the Nine-Nine, they now have a bigger problem on their hands: the Vulture is their new boss. As the Nine-Nine goes through its turmoil, there is one bright spot for Jake and Amy — they have, officially, decided to give their relationship a go. But just because they’re now dating, don’t expect to see a massive change in the show’s dynamic. 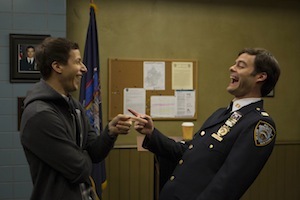 What did you think of the BROOKLYN NINE-NINE season premiere?